Posted by admin on Apr 17th, 2019 and filed under News Extra. You can follow any responses to this entry through the RSS 2.0. Both comments and pings are currently closed. Irked by the continuous outrageous billings of the Enugu Electricity Distribution Company, EEDC, women of Umudibia Nekede Autonomous community, Owerri West, Imo State, in their numbers took to the streets of Owerri protesting the poor supply of electricity in their area. The women who complained bitterly EEDC to stop billing them outrageously citing that, regular power supply stopped with full electricity since 2015. They regretted that the EEDC has since, refused to mount Prepaid Metres as charged by the Minister for Works, Housing and Power, Raji Babatunde Fashola, to enable control bills and curtail outrageous charges, but all has proved abortive as the electricity company has continued in what they described as scandalous, shocking and unacceptable billing methods. 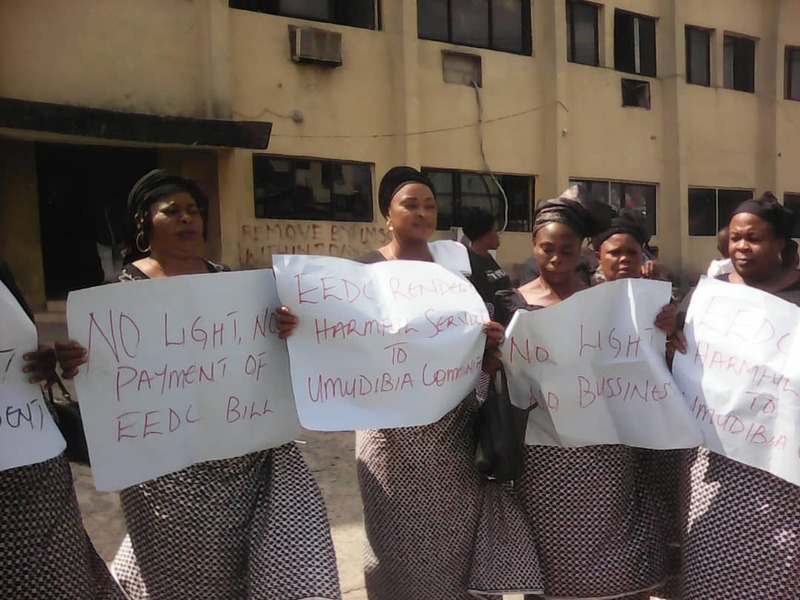 The women who protested peacefully, uniformly dressed on black clothing, carried placards which have inscriptions as: “No Light, No Payment of EEDC Outrageous Bills”, “Umudibia Nekede Women Say Let There Be Light”, “EEDC Renders Harmful Services to Umudibia Community”, “No Light, No Business At Umudibia Nekede”. The leader of the protesters and President-General, Umudibia Nekede Community, Lady Ijeoma Onyenobi said in an interview that, they were demonstrating against poor supply of light, scandalous, outrageous charges, none use of Prepaid Metres and outdated electricity facilities by EEDC. According to Lady Ijeoma Onyenobi, ” For the past four years, there have not been any regular supply of electricity at Umudibia Nekede community despite the huge money we pay monthly on bills. We have been agitating over the years, no one, not even the government or EEDC, cares to listen to our plea for help and our lack of electricity plight”. “During elections light comes fractionally, but dwindles thereafter. We were formerly with Umuoma Power Line, but now we are on Naze Power Unit whence we are having worse times. When light eventually comes, it goes off again within 3 seconds, sometimes an hour. At times in six months we would not see light at all. Some areas are hooked up to Federal Power Line, some to State Power Line. The Federal Power Line is 100 percent better, at least consumers use 20% of light paid for and are not outrageously billed even though there are no Prepaid Meters.” She continued. ” With no Prepaid Metres how does one read the metres to know amount of light consumed? She queried. “We want metres supplied to reduce the billing, just as electric facilities as Transformer, Solid High Tension and Low Tension Wire be put in place while regular supply of full electricity should be prioritized to encourage business, productivity and hardwork”. She cried. They however threatened to stop paying any bill if no efforts are made to ameliorate the sufferings they go through at the hands of the electricity company while they appeal that the government should call EEDC to order in order to prevent break down of law.